Loud snorers may (and sometimes may not) have a more serious case of blocked air passages, known as apnea. Sleep studies are the important next step to determine the presence of sleep apnea. Sleep apnea is a potentially serious condition that in rare cases can even cause death. Often people with sleep apnea are very tired and fall asleep exceptionally easily during the day, often at inopportune times. The intensity of a person’s snoring is not necessarily an accurate indicator for sleep apnea. 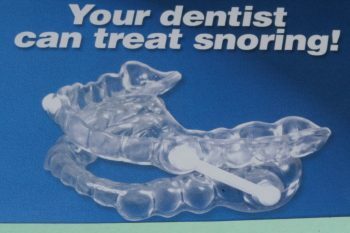 Doing a monitored sleep study (sometimes covered under medical insurance when ordered by your physician) is the first step in evaluating the level of sleep apnea and determining if an oral appliance worn at night is the appropriate treatment for you. Patients treated for sleep apnea report a big increase in restful sleep and daytime energy.